Wed., Nov. 22, 2017, 1:24 p.m.
Silas Melson is going home to Portland for the holiday and he apologizes up front about not returning numerous texts, emails and voice mails. The steady senior guard, a two-time state champion at Portland’s Jefferson High, and his Gonzaga teammates take on Ohio State late-night on Thanksgiving Day at the PK80, which honors Nike founder Phil Knight’s 80th birthday. 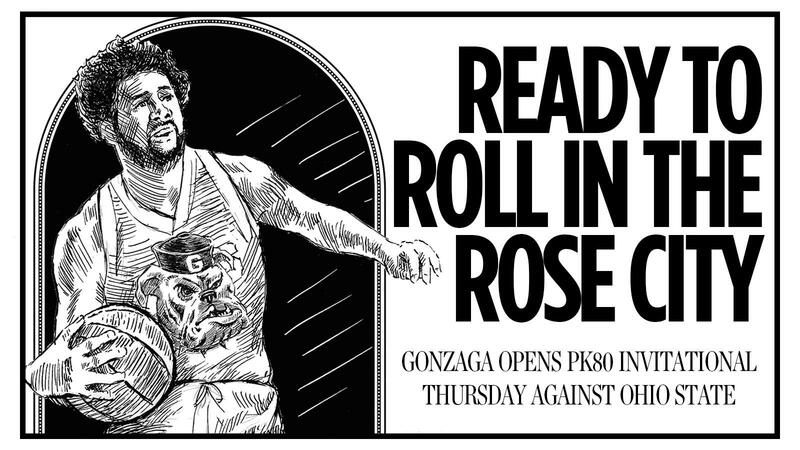 The 17th-ranked Zags (3-0) will face No. 7 Florida or Stanford on Friday and a potential matchup with No. 1 Duke looms Sunday. Now, about those ticket demands from Melson’s inner circle. The Zags know they will encounter more athleticism and size against Ohio State (4-0) than they faced in their first three games. Ohio State’s offense is carried by forwards Keita Bates-Diop and Jae’Sean Tate, but one of the more interesting matchups will be at point guard between C.J. Jackson and the Zags’ Josh Perkins. Both teams lack depth at the position. Perkins, who shared point guard duties with Nigel Williams-Goss last season, has been more aggressive offensively and he’s shot well from distance (11 of 24 3-pointers). He leads the team in scoring (13.3), but he’s committed eight turnovers, many unforced. Jackson has an elevated role, too, after averaging 19 minutes last season. He’s been solid for the most part, scoring 19 points in one game and handing out nine assists in another, but he had seven turnovers against Radford. Both teams have ruled the boards at nearly plus-15 per game, but that was against overmatched opponents. Sophomore center Micah Potter, who sprained his ankle in Ohio State’s win over Northeastern on Sunday, is expected to play. Gonzaga has thrived in Thanksgiving tournaments with a 20-2 record in its last six events. The Zags have won five holiday tourneys and played for the title eight times in 12 attempts in Few’s 19-year tenure. Many of the Zags have played on big stages in college basketball but this will be a first for several, including freshmen Corey Kispert, Zach Norvell Jr., Jacob Larsen and Jesse Wade. Published: Nov. 22, 2017, 1:24 p.m.